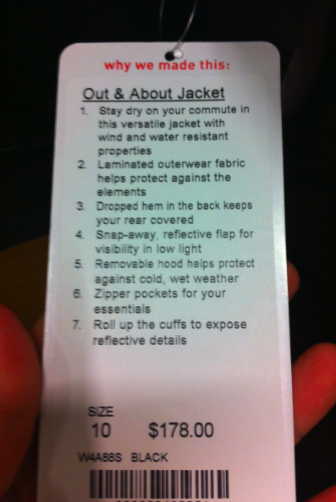 I tried on the Street to Studio Jackets this afternoon and liked them, except for the length. 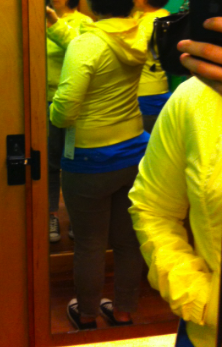 The size 10 (my TTS) was pretty roomy in the body and arms but pretty cropped on my long torso. I liked the fit of the 8 better on me in the chest and arms but it was even shorter in length. Had the length gone over my hips in the 8 I would have loved it. I think this jacket is meant to replace the Dance Studio Jacket but I find that a little odd since the Dance Studio Jacket is reversible and quite structured and figure flattering. This one is cute of course, but doesn’t have the ‘sexyness’ if you will that the Dance Studio Jacket has. I thought the price at $98 was fair. It’s Durable Water Resistant, and the inside is cool max and quite soft. 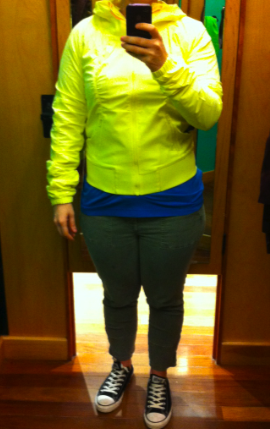 I brought home the size 8 in Mellow Lemon (really loved both color options) and will try it on with a few other pants. These where not ideal pants to try these jackets on with so I’m willing to try it on with a few more items before I decide. Right now though, the jury is out. The Omega logo on this jacket is way more subtle than the Dance Studio Jacket. It’s really only the upper half of the logo that is seamed in and the bottom half is completed by the pockets. The Omega logo is much more apparent when you size down as the bunching of material makes it get lost in the size 10. The size 8 hits me right at the waist band of my pants. 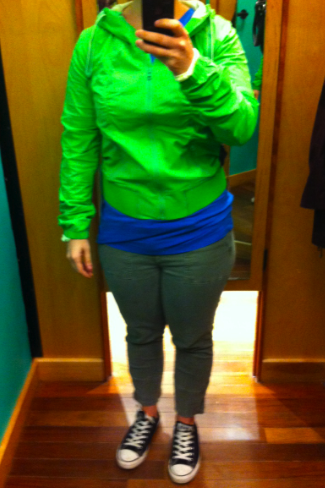 Fine when I’m wearing Ebb and Flow crops or Wunder Unders but if I want to wear this with jeans it’s too short. This jacket was priced quite high in my opinion. 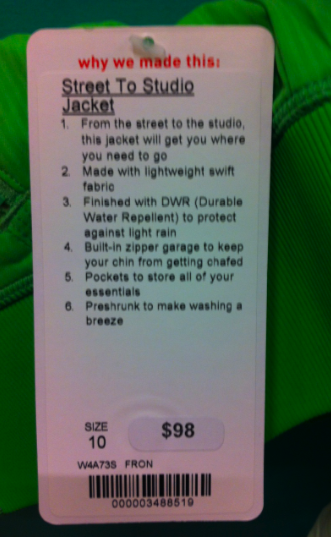 It’s similar weight to my Right As Rain Jacket, way shorter but with a few more features. 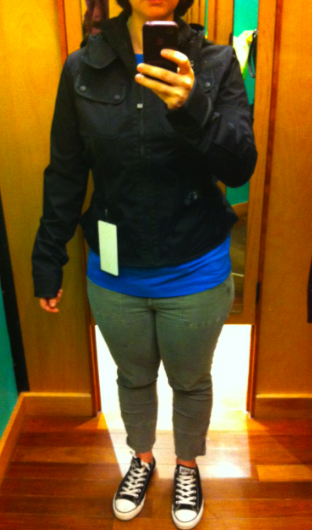 I liked this jacket from the high waist up, and really hated it from the high waist down. Its super short and the back tail has a really exaggerated flare. 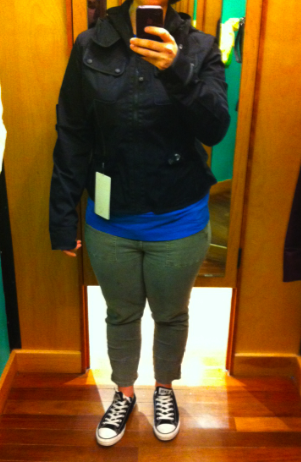 I loved the military style pockets, but this jacket is really short. I grabbed my TTS 10 and it was roomy in the bust but because of the stiffness of the fabric I would not size down, and also because I cannot afford to lose any length on this one. Easy pass for me. "Product Drop Monday! Coast To Class Crops, Out and About Jacket,"
"New! Studio To Surf Jacket"